Move over denim–it’s allllll about the paper bag waist pants. 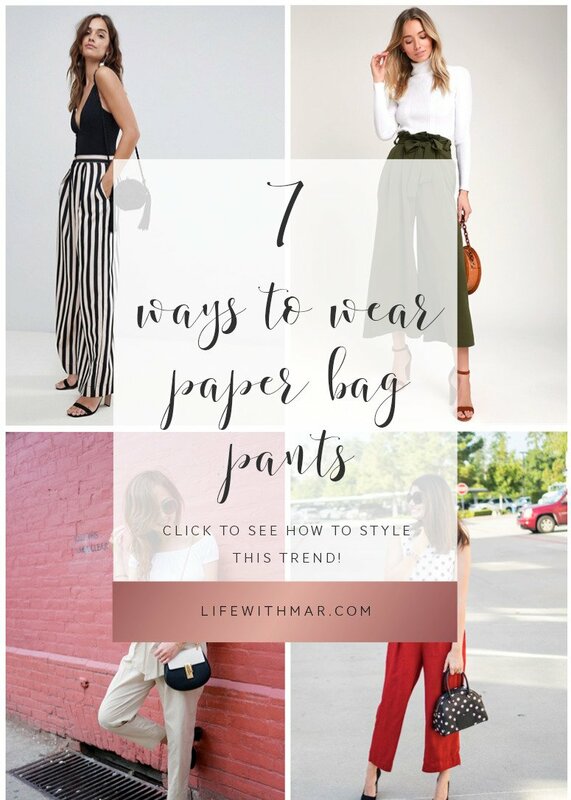 If you’re looking for some paper bag waist pant outfit ideas, I’ve rounded up seven of my favorites to inspire you. Plus, some of the cutest paper bag waist pants on the web! These waist-cinched pants come in wide-leg, tailored and even cropped versions. And I’m loving the color options, too! But they can be a bit tricky to pull off. 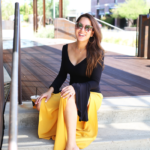 Yes, you can get away in flats, like a nice pair of loafers, but if you’re on the petite side, I’d really recommend styling them with heels for some extra height. Here are seven ways to wear paper bag waist pants to inspire your spring wardrobe! Spring is here, friends! 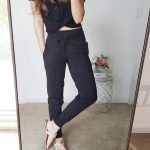 And one of the easiest, most fool-proof ways to pull off the paper bag waist pants trend is to style them with a tucked-in cami or bodysuit and a great paper of heels. These wide-leg striped pants are from ASOS and the vertical lines elongate the legs, making you appear taller! That’s especially great with pants like these, which can be a bit difficult to pull off. Plus, they’re on sale right now for $30! If you work in an office, paper bag waist pants are such a fun look. They’re conservative enough to be workday approved and comfortable, too! You can pair them with a closed-toe heel and modest blouse like Cat from Classical Trendsetter did for a trendy look. This look spotted on Love Between the Racks is perfect for a hot summer day! Since paper bag pants tend to be high-waisted, you could absolutely pull them off with a crop top. You could also style this look with flat sandals or even espadrilles. I just ADORE the way Folake Kuye Huntoon from Style Pantry paired these chambray paper bag waist pants with that gorgeous red heel. Notice how her lips are perfectly matched with the sandals?! So lovely. These paper bag pants are a more slim fit version, but you’d still style them with a tucked in blouse. If you don’t want to commit to a colored paired, chambray makes a great neutral option! These B.P. ones are under $50. 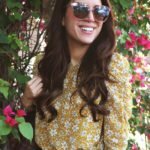 Feeling more of a cropped look? 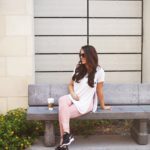 I’m loving these wide-legged cropped pants for spring! And they can be styled with a sweater, as shown, or a tank, too. Plus, this pair from Lulus is just $45! You could also style this with cream, grey, black or add some color with a mustard yellow top. Yup, you can style paper bag waist pants with sneaks or loafers! It makes the whole look more casual and great for weekending. 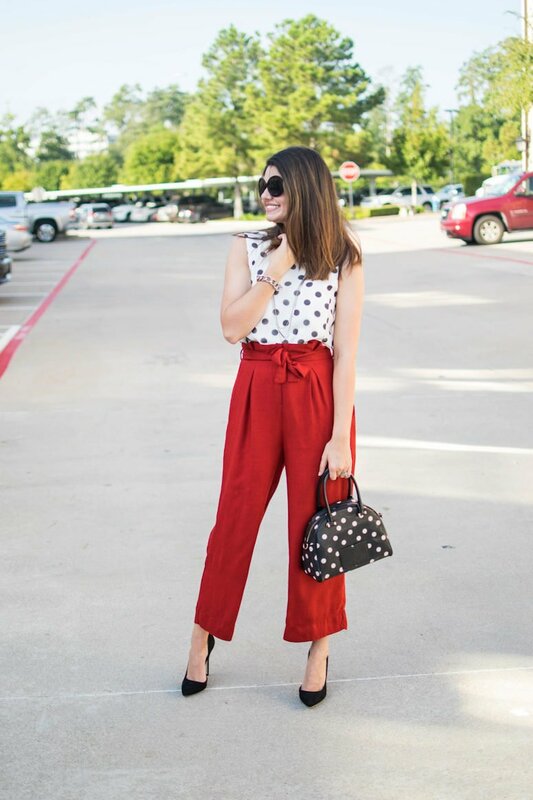 This look from The Fancy Pants Report is another great way to wear these pants for spring. 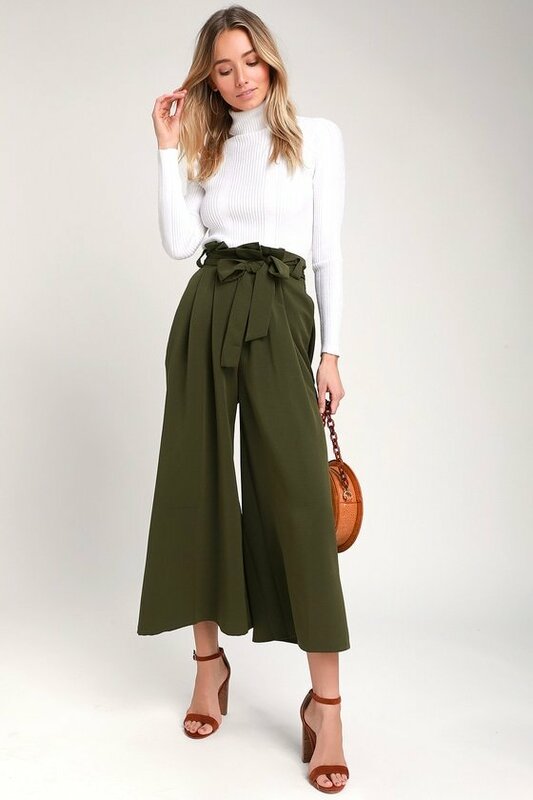 One of my favorite things about the paper bag waist pant trend is it’s really an outfit that can transition easily from day to night. Take, for example, this look styled by Pam of The Girl from Panama. These camo-colored pants look great with a tucked-in cami and a blazer. And this easily translates from the office to happy hour! What do you think of the paper bag pants trend? Are you into it? Let me know in the comments below!